The idea of eco-industrial parks, zones, or districts has been around for quite a while, at least from the 1990’s. Based on industrial ecology, with the idea of designing industrial systems to behave like an ecological system. 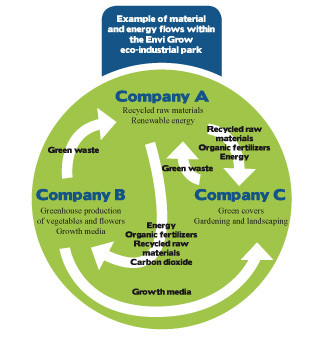 If Industrial Ecology is designed around optimising materials and energy flows, in Eco-Industrial Parks the flows of waste and energy are co-designed with a group or cluster of eco-industry businesses, working together to harness their optimum use, the industrial equivalent of an ecological system. 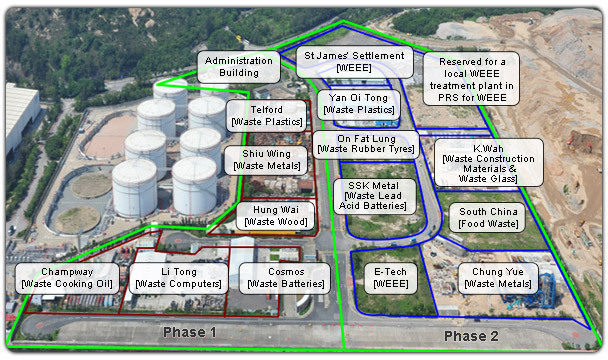 At their most basic Eco-Industrial Parks involve exchanges between firms of their excess energy and materials. Waste from one firm becomes the raw material for another. Industrial processes are linked systematically to reduce consumption of raw materials, water and energy. Industrial waste can become raw material for linked businesses. Co-location or proximity: A variety of companies which are clustered near to resource recovery and recycling facilities. Shared byproducts: Companies use waste energy and material from others as inputs in their own processes. Cleaner production: An emphasis on cleaner production throughout the production process. Resource Recovery Park – A group of reuse, recycling, and composting processing, manufacturing, and retail businesses receiving and selling materials and products in one location. Zero-Emission Park – A group of co-located businesses working together to reduce or eliminate emissions and wastes. Virtual Eco-Park – A group of businesses that are geographically separate, but still working together to minimize their impact on the environment. Although the “first and canonical example” of an Eco-Industrial Park originated in Europe – Kalundborg on Denmark’s Western coast – as an approach Eco-Industrial Parks have been more popular in the USA, and also in recent years have begun being developed in China. For examples of Eco-Industrial Parks from different parts of the planet click here. 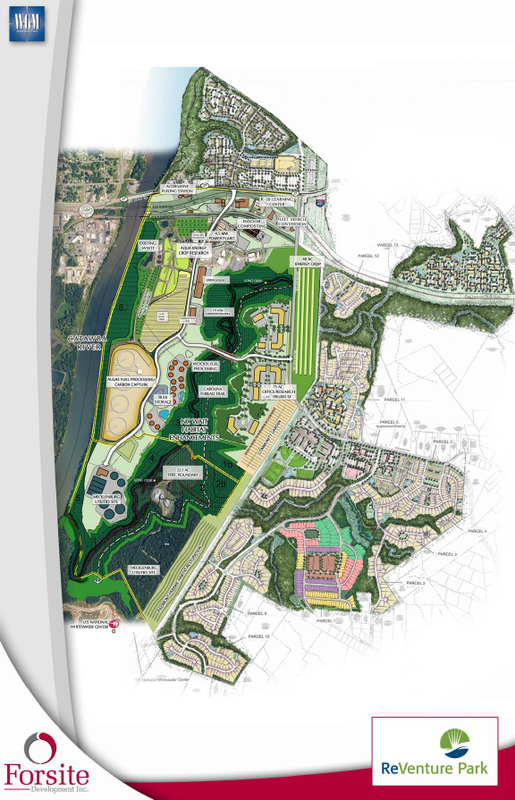 The ReVenture Park is in the early stages of developing the largest US eco-Industrial Park of its type. Situated on a 700 acre site, ReVenture’s core plan is organised around a large renewable energy complex. Facilities for waste-to-energy power plant, wastewater treatment, solar energy fields, clean tech start-ups and R&D hub are to be developed inside and around an old textile dye factory – with half a million square feet of industrial space. Publicity states that a significant campus and educational aspect to the eco-development is part of the plan, with more than 1,100 “green collar” jobs being created. Old already in place railway tracks, multiple electricity substations, transmission lines and a 360 million gallon containment pond add to the in-situ infrastructure for ReVenture. A portion of the extensive site is reserved for natural wildlife habitats. The Monterey Regional Waste Management District Regional Environmental Park is both considered an Eco-Industrial Park and described as a prime example of a Resource Recovery Park. In 1991 it was recognised as the ‘best integrated waste management system’ in North America. What might look to some like a mega recycling dump, has been carefully designed to optimise the waste which arrives by the hour, split into different groups such as the public drop-off recycling station and Last Chance Mercantile resale facility. Around 60% of the materials turned in to the Park’s Household Hazardous Waste collections, are reused by the community through a “drop and swap” programme, significantly reducing disposal costs. A Materials Recovery Facility (MRF) processing more than 100,000 tonnes of community waste that arrives annually, with a 75% target for recycling and reuse. Significant amounts end up in the award winning Last Chance Mercantile, which then are sold back to the community. Construction and demolition materials are sorted as is waste wood. There’s also a wide range of green products composting and soil blending facilities. Monterey was one of the earliest adopters of landfill gas to electric energy in the States, with 5 megawatts of electricity generated annually. Two years ago a compost pilot demonstration project using SmartFerm anaerobic system is processing 5,000 tons of organic material per year. If this isn’t the usual form that Eco-Industrial Parks are envisaged, it graphically shows the overlap between organising recycling waste and their more effective reuse. Rantasalmi, in mid-Finland is the site of Finland’s first wood materials industrial park, with waste wood powering the electricity plant, and its excess heat warming the cluster of on site wood businesses. Businesses at Rantasalmi aim to increase their collaboration over time, improving material and energy efficiency, reducing waste and limiting emissions. All businesses have agreed to and signed a common environmental policy. 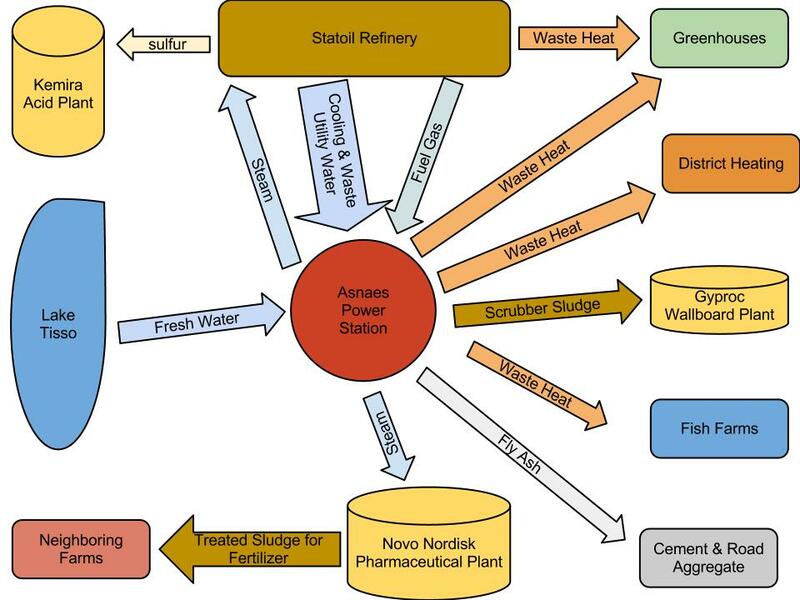 The Forssa Eco-Industrial Park, Finland is focused on ‘bio-economy’ fused with expertise in recycling. This includes the optimisation of large modern greenhouses and the production of green covers (sod turf), growth media and bio-fertilisers. 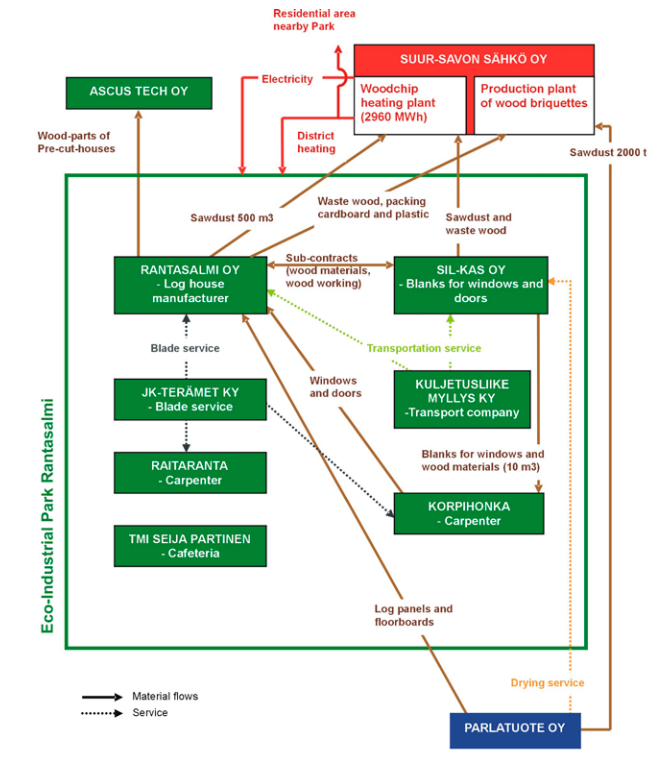 Applying a closed loop cycle, materials and energy are linked to other industries in the eco-industrial park including biogas and biodiesel production for use as transport fuel, in utilisation of carbon dioxide separated from biogas, and in industrial aquaculture using bio-energy and the innovative utilisation of the by-products from the food industry. At the core of the park is a comprehensive bio-refinery that diversely utilises different by-products of the food industry. The Eco-Park is closely linked to the Forssa Envitech, which is a leading Finnish centre in glass recycling and is a significant national centre in the handling of electric and electronic scrap, contaminated soil and biowaste. At the Hong Kong Eco Park a number of recycling firms co-exist side-by-side on a 20 hectares plot. The companies recycle a variety of waste materials such as cooking oils, wood, metals, electronics, plastics and batteries. 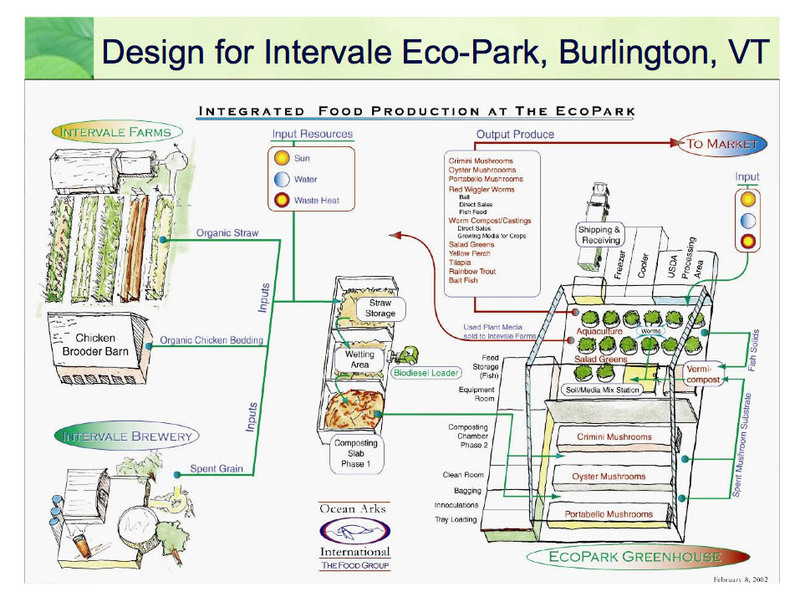 Intervale Eco-Industrial Park is an agricultural and farming focused Eco-Industrial Park. Waste Heat from a Biomass Plant warms greenhouses for a mixture of local farms, and a community garden. Food waste from Burlington city is mixed with wastewater from the local Ben & Jerry’s ice cream plant (yes, Burlington is the home to Ben & Jerry’s!) which mulches into fertiliser, which is then used by both the Intervale and other farmers. Intervale is a demonstration site for the first Living Machine, invented by biologist John Todd, as a natural water purifier. The water is treated using plants, cleaning a specific waste stream, using diverse communities of bacteria and other micro-organisms, algae, plants, trees, snails. The Living Machine is a good example of ecological engineering. Kalundenborg in Denmark, is one of the best-known (and one of the oldest) examples of an industrial ecology in action. Different companies at Kalundenberg use each others waste. For instance Kalundborg’s power plant produces various materials and energy flows; gypsum which then is used to produce plasterboard, and steam, which warms fish farming ponds. In turn sludge from the fish-ponds and factories fertilise local farms.